Background: Bipolar electrosurgical and ultrasonic devices are routinely used for hemostasis in open and advanced laparoscopic surgery. Currently available ultrasonic and bipolar electrosurgical instruments with tissue sensing technology can seal blood vessels with efficacy equal to that obtained with surgical clips or ligatures. Recently, a new generator (ForceTriadTM) has been developed . This new electrosurgical generator is of improved quality and demonstrates efficiency in blood vessel sealing. Aim: To compare currently available 10-mm laparoscopic electrosurgical devices with the LigaSureTM Vessel Sealing System and the ForceTriadTM generator (Valleylab, Inc.,Boulder, CO; a division of Tyco Healthcare), especially with regard to burst pressure, seal time, failure rate, and thermal injury. 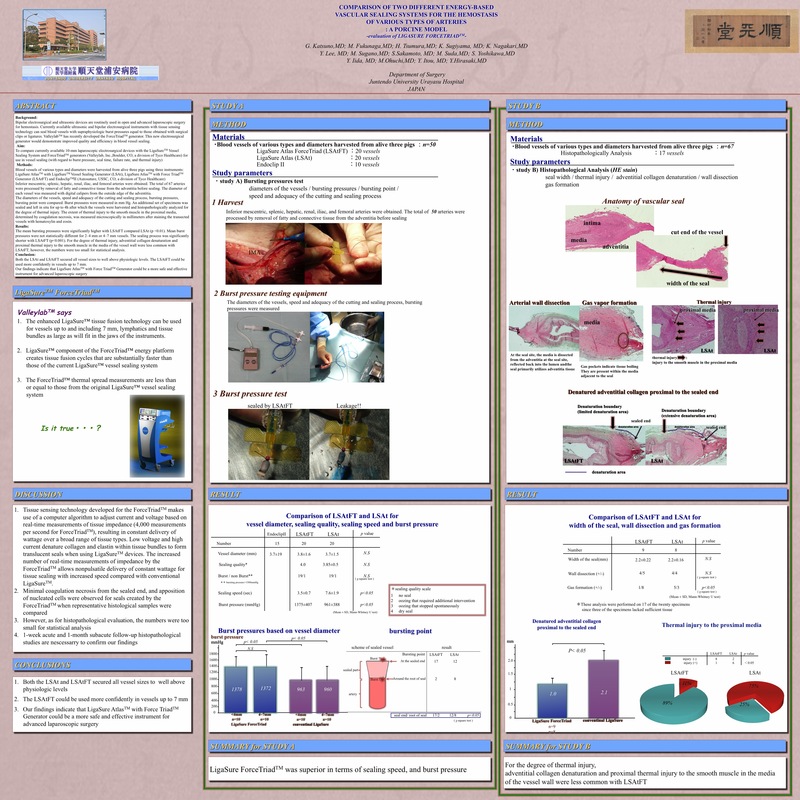 Methods: Blood vessels of various types and diameters were harvested from three pigs under anesthesia using three instruments: LigaSure AtlasTM with LigaSureTM Vessel Sealing Generator (LSAt), LigaSure AtlasTM with Force TriadTM Generator (LSAtFT) and EndoclipTM II (Autosuture, USSC, CO; a division of Tyco Healthcare). The inferior mesenteric, splenic, hepatic, renal, iliac, and femoral arteries were obtained. In total, 40 arteries were harvested and fatty and connective tissues were removed from the adventitia before sealing. The diameter of each vessel was measured with digital calipers from the outside edge of the adventitia. The diameters of the vessels, speed and adequacy of the cutting and sealing process, burst pressure, and burst point were compared. Burst pressure was measured in mm Hg. An additional set of specimens was sealed and then histopathologically examined to assess the degree of thermal injury.